Have you explored the Rocky Top Wine Trail? 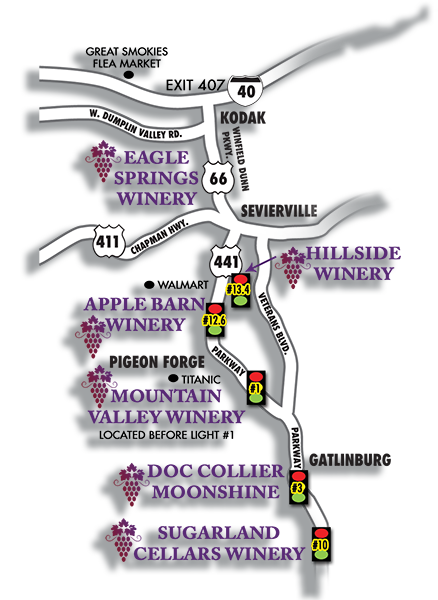 The trail is made up of 5 wineries located from Sevierville through Pigeon Forge to Gatlinburg – with a moonshine distillery thrown in for good measure at the Gatlinburg end. All locations along the trail are open 7 days a week, and each winery offers free samples. As a bonus, some also offer tours of the cellars and tank rooms in the afternoons. You can pick and choose which wineries to visit and when, it doesn’t all have to be on the same day. You can pick up a passport at your first stop (or download it in advance from the Wine Trail website) to get stamped at each stop in the trail. This enters you into a drawing with prizes, and also nets you a gift wine glass at the 3rd stop, and a shot glass if you complete the trail. Several of the wineries have souvenir shops and eateries attached or nearby, so you can make a relaxed day’s outing out of the experience. With over 60 varietals, including honey wines, apple wines, and the famous sweet southern Muscadine, it’s perfect for those who like to sample new wines before buying. Eagle Springs Winery at the top of the Wine Trail is close to I-40, off Exit 407 – actually in Kodak. The winery specializes in honey wines, with many varieties blended with fruit. You can find unique and delicious flavors here, along with some wine cocktail ideas. Get ready to pick up some bottles to take home. The winery is situated in a large renovated log cabin in a very scenic setting. Hillside Winery is the next stop south, located at Governor’s Crossing in Sevierville. Also offering afternoon tours, the winery specializes in Italian wines from dry to sweet, as well as bubbly wines – try their Muscadine Spumanti. Also check out their Wine Freezers. Here’s a list of their varietals. Apple Barn Winery is also in Sevierville, located on the Little Pigeon River at the Cider Mill, surrounded by restaurants and shops selling gifts and ice creams and even Christmas things. This winery crafts its apple-based wines by hand from its own apples on the same land. The winery also uses grapes and produces its own Merlot, as well as other fruits, and of course its own Muscadine. There’s a glass viewing area to watch some of the operation. Heading down to Pigeon Forge, Mountain Valley Winery is the next stop, a renowned winery and winner of several awards – including for their Rhubarb wine. German and French wines are the mainstay here, with a lot of sweet fruit wines and of course Muscadine. Here are their wines. Afternoon tours are available here. 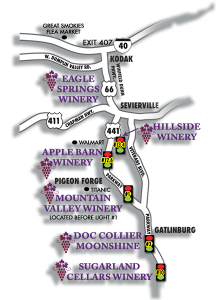 If you’re exploring the Wine Trail by strict geography, your next stop isn’t a winery but Doc Collier Moonshine Distillery, at Light #3 in Gatlinburg. There’s an opportunity to see what a still looks like, as well as to sample the distinctive taste of Tennessee moonshine – and its many flavors added by modern distillers. The brandy is highly regarded. Visit the Mercantile Store for souvenirs to take home with you (as well as some of the ‘shine). 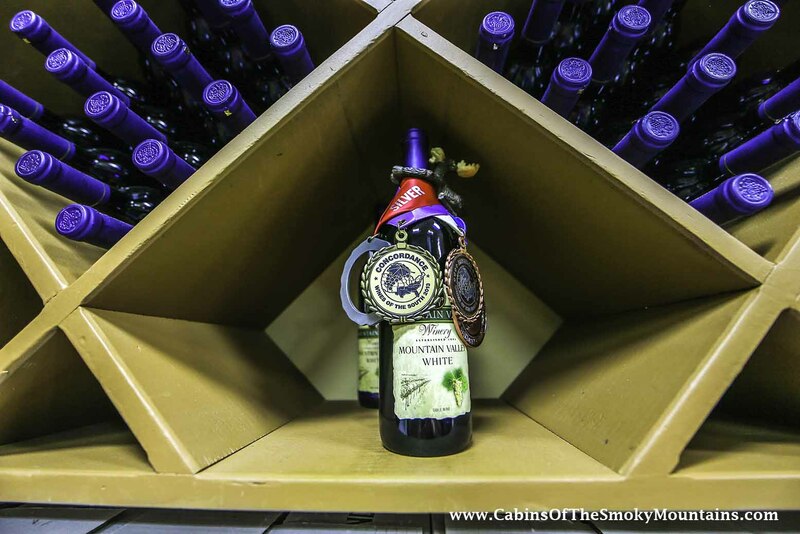 Back on the Wine Trail, the final winery is Sugarland Cellars, located at Light #10 on the south end of Gatlinburg, right at the entrance to Great Smoky Mountains National Park. Also offering tours, and with a gift shop, Sugarlands is one of Gatlinburg’s favorite wineries, embodying much local history. local wines from locally grown grapes are the key to Sugarlands varietals, and they have a large selection of their own distinctive flavors. For more information, see the Rocky Top Wine Trail website, and also the Facebook page for latest news and events.